Modern Flap Card PHOENIX (8 of Spades to Ace of Spades) by Hondo. 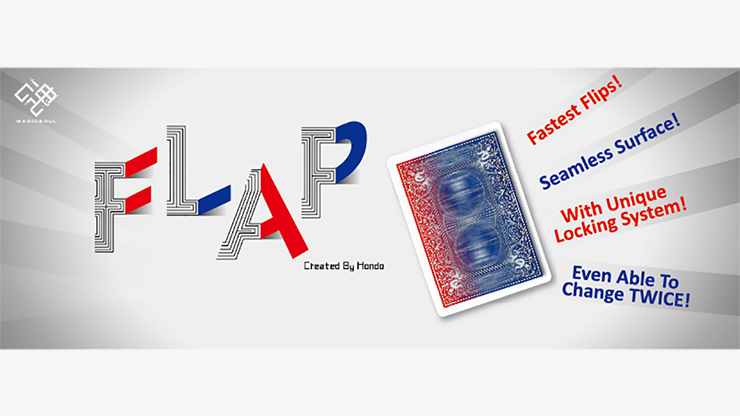 The Flap Card was first introduced in 1922, in Professor R. Kunard's Book of Card Tricks. In the decades since, it has become a staple in the routines of magicians worldwide, used to produce all sorts of stunning effects. However, limitations of the original 1922 design constrain these performances: magicians must precisely position their audience, keep constant pressure on the card surface, and perform tricks almost immediately after setup for best results.